Agit-prop, a contraction of the words "agitatsiia" and "propaganda" was an omni-present activity in the post-Revolutionary Soviet Union. 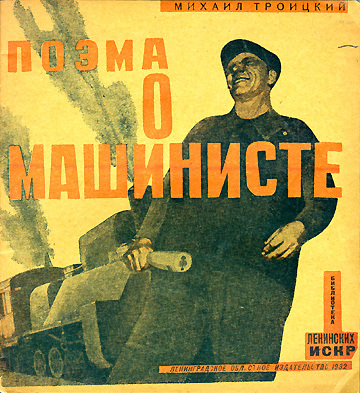 Intended to inculcate and promote appropriate social class values among the masses, its many forms (palaces of culture, use of agitation trains and cars, poster campaigns, and the countless agitation centres, or 'agitpunkts', among others) served as a powerful means of politically educating the population at large. Books and libraries played an important role in the agit-prop entreprise. 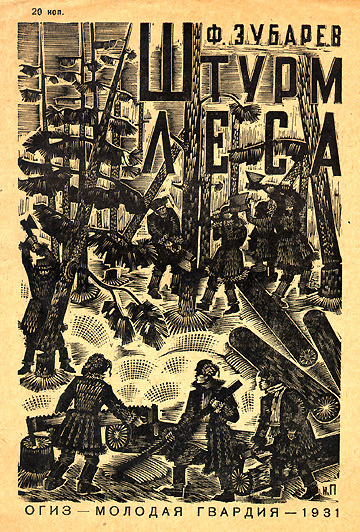 Titles on display include Zubarev's Poema o mashiniste (Poem about the machine operator,1932), Kreiser Avrora (The battleship Aurora, 1931), Shturm lesa (Assault on a forest, 1931)and Kak pobedila revolutsiia (How revolution won, 1930, or a series such as the Library of a Pioneer-Shock-Worker were intended to reinforce the memory of great moments in the revolutionary struggle, pride in the valour of labour and the victory of the working classes, and the achievements of the five-year plan. Shvarts, Evgenii, 1896-1958. Kreiser Avrora / ris. B. Inozemtsev. -- Leningrad : Molodaia gvardiia, 1931. Description: <12> p. : col. ill. ; 23 cm.Notes: Cover title. 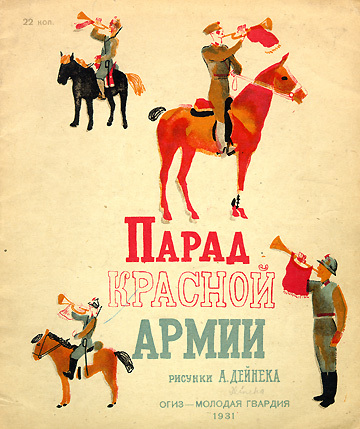 Illustrations are chromolithographed..
Zubarev, F. Shturm lesa / graviury na dereve N. Prokhorova. -- Moskva ; Leningrad : Molodaia gvardiia, 1931. --Description: 31 p : 4 ill. ; 18 cm.Notes: Woodcut illustrations..
Savel'ev, L. S. (Leonid Savel'evich), 1904- Chasy i karta Oktiabria / L. Savel'ev ; oblozhka i risunki N. Lapshina. -- 2-e izd. -- Moskva ; Leningrad : Molodaia gvardiia, 1931. --Description: 17 p.(i.e. 19) : ill., map ; 22 cm. Kak pobedila revoliutsiia / risunki A. Poret. -- Moskva : Gos. 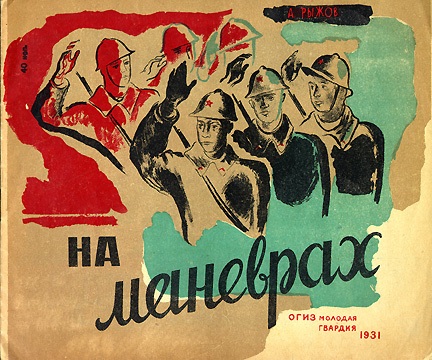 izd-vo, 1930. Description: 14 p. : col. ill. ; 20 x 23 cm. Notes: Cover title. 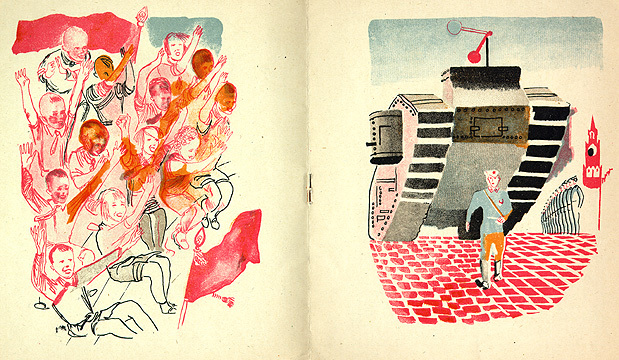 Illustrations are chromolithographed..
Click here to see the title page.
. -- Moskva : Molodaia gvardiia, 1931. Description: <16> p. : col. ill. ; 19 x 23 cm. Notes: Cover title. Illustrations are chromolithographed..
Deineka, A. (Aleksandr Aleksandrovich) Parad Krasnoi Armii / ris. A. Deineka. -- Izd. 2-e. -- Moskva : Molodaia gvardiia, 1931. Description: <12> p. : all col. ill. ; 23 cm.Notes: Cover title. Illustrations are chromolithographed..